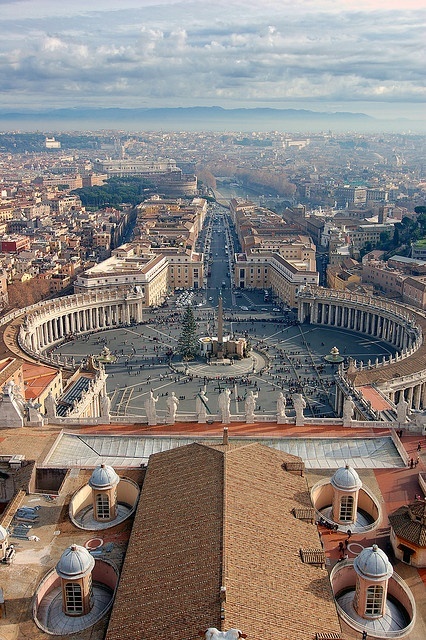 Saint Peter's Square is a massive plaza located directly in front of St. Peter's Basilica in the Vatican City, the papal enclave within Rome, directly west of the neighborhood or rione of Borgo. At the center of the square is a four-thousand-year-old Egyptian obelisk, erected at the current site in 1568. Gian Lorenzo Bernini designed the square almost 100 years later, including the massive Tuscan colonnades, four columns deep, which embrace visitors in "the maternal arms of Mother Church." A granite fountain constructed by Bernini in 1675 matches another fountain designed by Carlo Maderno dating to 1613.